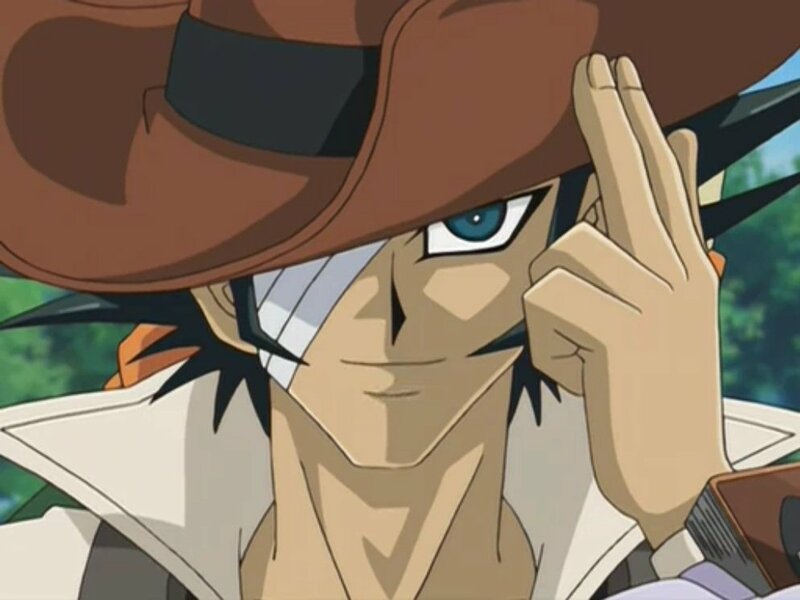 After recapping the events from the last series in a clip show for the first episode, we witness Jaden and his friends starting their third and final year at Duel Academy. Among the new arrivals is a new teacher, Prof. Thelonious Viper, who you have probably already guessed from his name is a baddie. In fact, he couldn’t sound more like a villain unless his name was Evil McEvilface. Viper decides to improve the students by forcing them to duel each other, while wearing wrist bands that monitor them. There are also four new transfer students taking part: Adrian Gecko, an orphan adopted into a rich family who has a deck made up of cloud-themed cards; Axel Brodie, an African-American soldier-like student with a gun-shaped Duel Disc and a flame-themed deck; Australian Jim Cook, a user of a fossil-themed deck and with a love of animal conservation so big he’s always accompanied by a pet crocodile Shirley; and Jesse Anderson from the Deep South, who like Jaden can communicate with his Duel Spirits. Jaden first battles Jesse and his deck of “Crystal Beasts”, a group of cards only he can control, and even then the rarest beast is missing, the Rainbow Dragon, and no-one knows where the card is. When the battle ends, the bands begin to drain energy from anyone taking part in them. This energy is being stored by Prof. Viper for the benefit of some sort of mysterious creature. Eventually Jaden, his friends and the new students realise something is up and manage to confront Viper, who tells him that the creature is a beast he is trying to restore who has promised to revive his dead son. 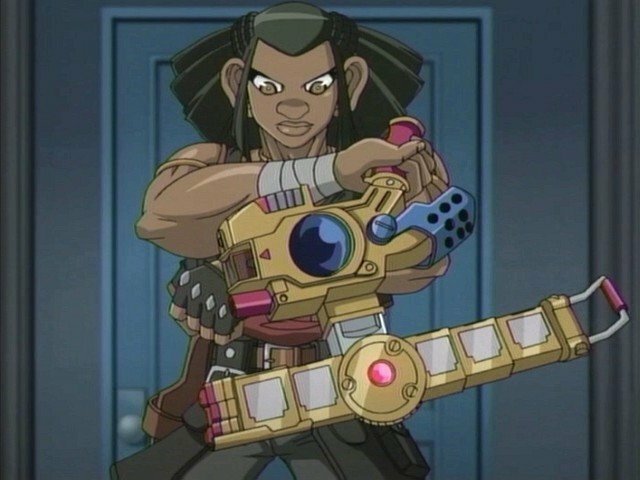 Jaden manages to defeat Viper, but the monster has gained enough energy to reform, and transports the entire Academy and student body to another dimension. The only people who are not transported are those absent from the island like Chancellor Shepherd and Aster Phoenix. In this dimension, Duel Monsters are real and thus the students have to summon their actual monsters from their decks to fight them off. The students learn more when they find an old friend has already ended up in this world before they did: Bastion, who found himself teleported to this world after a botched experiment. Bastion tells everyone that there are 12 different dimensions, some of which are inhabited by Duel Monsters, but it might be possible to figure out a way back. The problem is that the creature Viper created has now possessed another student, a new first year named Marcel, who is quite clearly Bonaparte’s son although he seems to deny it. The possessed Marcel uses his powers to start putting everyone in the Academy into a zombie-like trance, creating an army of “Duel Ghouls” who keep coming back to fight even after they have just been beaten. The trance spreads so destructively that even Chazz and Syrus end up victims. Soon the only people unaffected are Jaden, Hassleberry, Alexis, Bastion, Crowler, Bonaparte, the four new transfer students, and another new first year, but one we have met from a previous series, Blair, who still has a “thing” for Jaden. 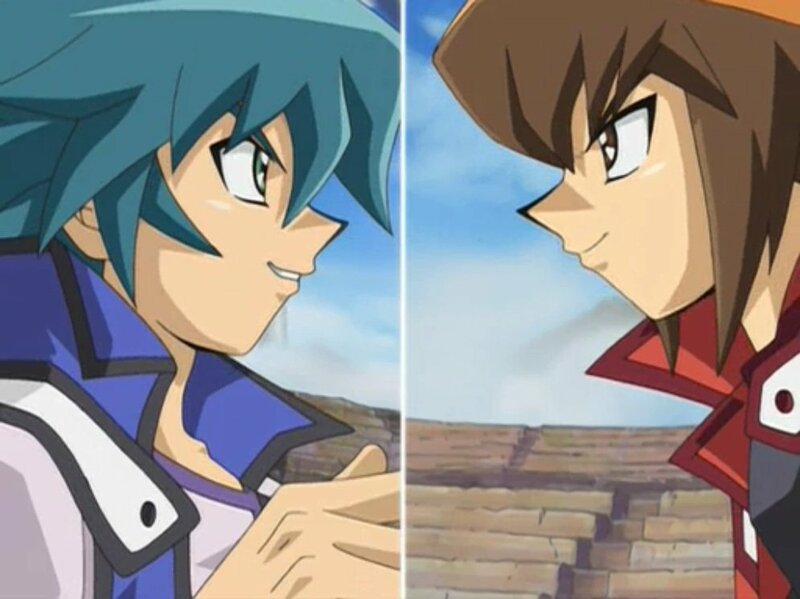 Eventually they find a way to communicate back home, where they learn that the Rainbow Dragon card has been discovered, and the only way to get back home is for Jesse to duel with it in a fearsome battle with Zane. After this has finished though, Jaden and his friends end up going to another dimension, where among other things Jaden learns the identity of the creature that has been causing all this trouble and falls victim to his own dark side. Having just reviewed the great Dark Side of Dimensions movie, this collection just reminds you of all the problems that the rest of the series has. Yes, the box sets have plenty of episodes, but you still have to put up with no subtitles, no extras and only having access to the English dub. 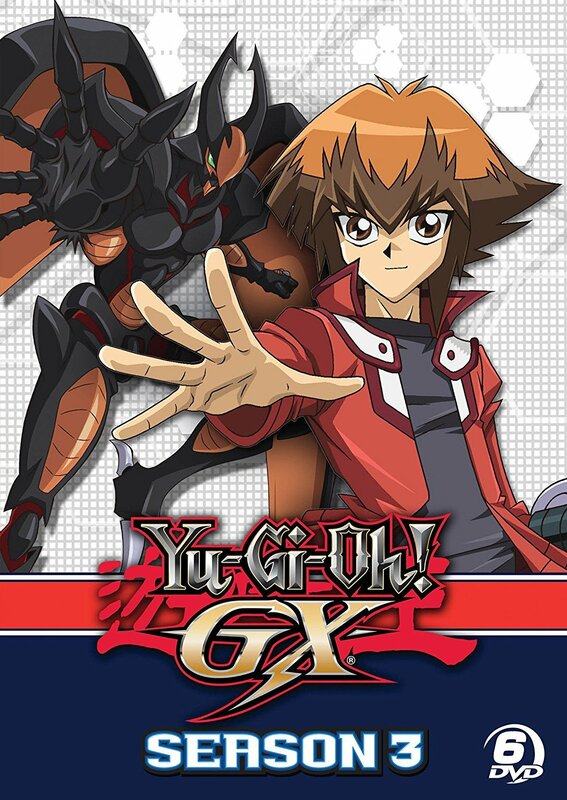 Admittedly though, the dub does have improvements over past Yu-Gi-Oh! dubs. Most notably, although it’s not the most authentic accent Jim Cook’s Aussie is actually recognisable as an Aussie accent, unlike Valon in the original series. However, the script still has problems. One scene sees Alexis skipping a class to go shopping with friends because; “You can never have enough miniskirts”, which is probably not the most progressive comment a woman has made. At one point Prof. Viper goes into full Scooby-Doo villain mode when he refers to Jaden and his friends as, “meddling kids”. The second half of the box set is the better one in my view, as it sees Jaden developing as a character and learning about how some of his ideas and attempts to help people are hurting others, with himself ending up a major antagonist in the story. But there’s one big problem with this collection and indeed this entire series, which is the way it ends. I don’t want to spoil it too much, except to say the ending is somewhat sad. The problem with this sad ending though is that it isn’t the real ending. There is an entire season still to go, but it was never dubbed into English because 4Kids were too busy working on the next Yu-Gi-Oh! series, 5D’s. As a result, this season has never been released on disc over here or in the USA. It is possible to watch the missing episodes on Crunchyroll, where the entire series is available in subtitles. However, if you are used to the DVD version, you will have to be prepared to learn the Japanese names of characters and everything might get a bit confusing. Having said that, because the box sets have no extras, cost so much, and are missing a whole bunch of episodes that will probably not get released any time soon, it saddens me to say that you are probably better off with watching it on Crunchyroll rather than buying the discs. Ian works as an anime and manga critic for Anime UK News, and is also the manga critic for MyM Magazine. Outside of anime, he also is the editor of On The Box, data specialist for the British Comedy Guide, is QI's most pedantic viewer, and has appeared on Mastermind. A collection that includes some of the best moments of the series – and some of the worst. Having been established since February 2004, Anime UK News is constantly striving to deliver high quality UK anime news and reviews to your computer screens each and every day, being sure to maintain high standards of writing and reliability. Designed and maintained by devoted anime fans, Anime UK News and it’s fledgling forum community is growing with each passing month, proving we are an ambitious and trusted resource for UK-based anime fans and beyond!